Tunzamunni is a full on tongue twister, though there is nothing difficult about this hugely popular slot from the epic Microgaming. The game has topped progressive jackpot tables for many years now, boasting the highest grossing top prizes players have ever seen, and paying out regularly too! The slot is a standard 3-reel, 1-payline setup, taking players back to basics with its super slick representation of the original slot machine. The old school symbols are used also with varying colours of 7 and different sized Bar’s being the order of the day. Of course the main attraction of the game is the excellent pay-out rates it boasts yet the makers haven’t slumped on the design, boasting some really neat looking graphics and authentic sound effects. Tunzamunni’s jackpot keeps growing due to the small increments that are taken from each player’s bets. 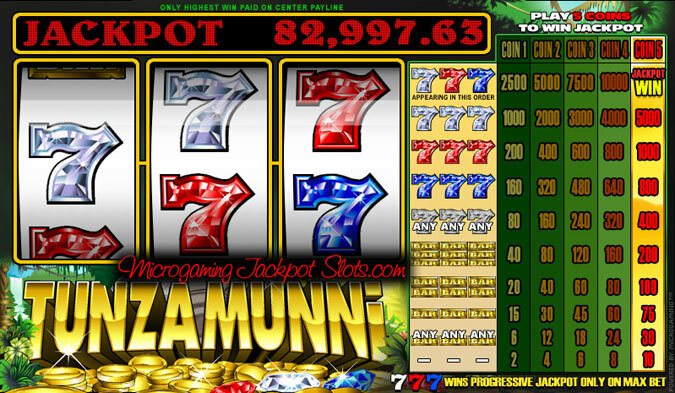 The great thing about Tunzamunni is that it is linked through a variety of different casinos across the internet. This allows the jackpot to rise ever quicker than normal and the chance of more players to be in with a shout of getting involved. The jackpot is hit momentarily once the white Seven, the red Seven, and the white Seven (7/7/7) show up on the single payline. There is no skill or finesse to spinning this lucrative top prize, all players need is plenty of luck! After this, the lucky gambler is paid the whole sum of the progressive jackpot! There is a nice consolation to players looking to play the game just after the jackpot has been landed: this being that there is a sizable minimum amount in place that the new jackpot resets too. The amount of coins staked determines the size of the prizes on offer, with an example of this show here. For example, spinning three bars on the payline, this will award players with 40, 80, 120, 160 and 200 coins when staking 1,2,3,4 and 5 coins respectively. There is a saying that has been used many times, ‘the simpler the slot, the wealthier the player’. This couldn’t be truer for Tunzamunni and is perfect for players who want to be in with as realistic chance of spinning a huge jackpot. Play now at Gaming Club.